Good advice. I always get a size bigger. I don't like tight clothes. I do like thinner Ts though so I should be good! haha The hoodie is made very well on the other hand. Very thick material but not heavy. Is the hoodie a pull over or zipper front? It is a pullover! Very nice. I would like a 'distressed logo' tee, but from the picture on the site it seems that the logo is not centered in height, it's much closer to the bottom than it is to the top, is that correct in real? I wore the shirt that arrived to my son's school for "parents come in and do a math game" this morning. Put a sweater over it because it looks ridiculously small. For reference, ladies, since there is no size chart on the store site, this is a medium ladies fit on someone who usually wears an 8 US / 12 UK. No stretch to the material at all, and like I said, really thin. The length is fine though (5 ft. 9 inches height). Are they using sandbag again? Some years ago I ordered a large plain logo shirt from their store & it was truly tiny & extremely thin. The summercure short I ordered never turned up (twice), but at least they refunded me. Tag reads "Next Level Apparel", made in China (o' cor!). Glad you got a refund. I'm can't make up my mind. 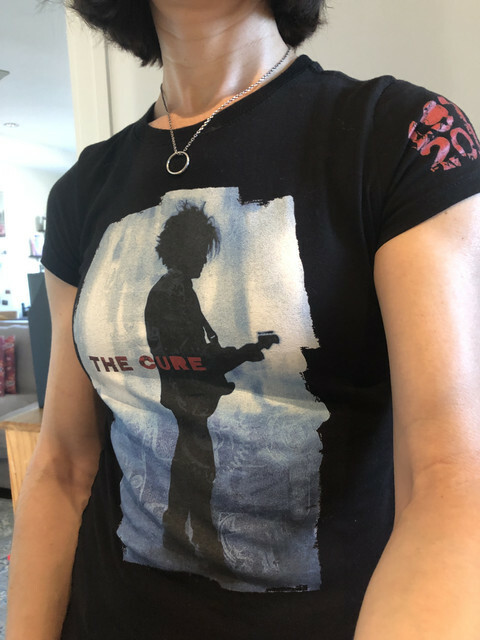 Since the new shop is online i really want a new Cure tee, but these official ones are really not to my taste. I'm thinking of buying an unoffcial one that i prefer much, but it doesn't seem right... Argh! they have so many to chose from it can't be you don't like any at all. Best has to be the hoodie one though. The receipt in the bag said UMG. Any other questions? What's the length of the receipt? hahaha I think UMG is doing this on their little own because The Cure are drawing some attention from the big dogs with their touring. But I am going to assume at least some of the money from the sale of these items is also going to Robert since he basically owns The Cure yes? I've never understood how royalties work and how people get paid from use of their art/brand, but then I've never looked into it either. There would likely be a contract between the band & UMG to detail who gets how much but typically an artist would make ~£5 on a £20 shirt. The rest would be costs for marketing, UMG's cut, etc. Got my A Forest shirt today and it's fab! !